Pufferfish. They are toxic (tetrodotoxin, to be precise). They can inflate when threatened to become huge, unwieldy balloons that are hard to eat. Most species have spines. These are things that just about everyone knows about Pufferfish. 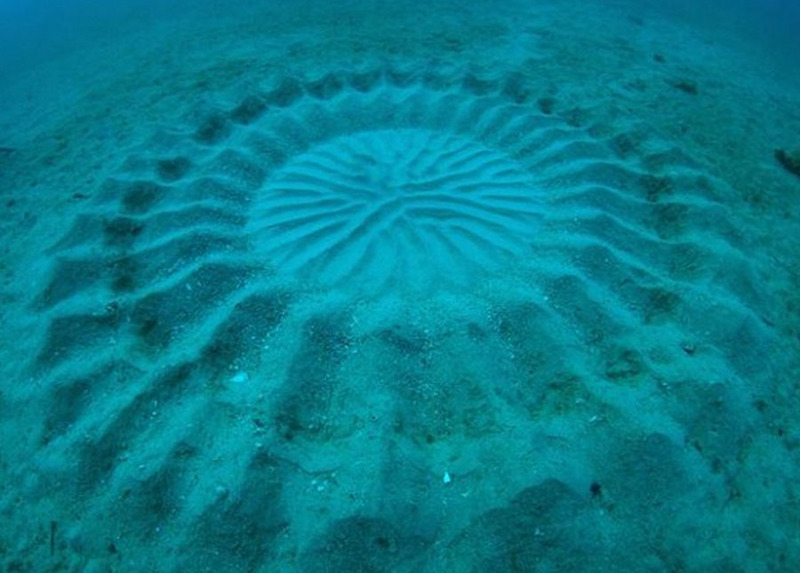 However, this is all that most people know about Pufferfish, and yet there is so much more to know. Pufferfish represent a family of fish called Tetraodontidae which contains 19 genera that have about 120 species between them. I want to bring your attention to one of those genera, in particular. It is the genus Torquigener. This genus has 21 recognized species that live in the Indian and Pacific Oceans. If you look up Torquigener on Wikipedia you find that they get their name from their ability to build circular structures on the sea floor. This description woefully underplays the amazing structures that the males of this genus build to attract a mate. A male pufferfish in his nest. 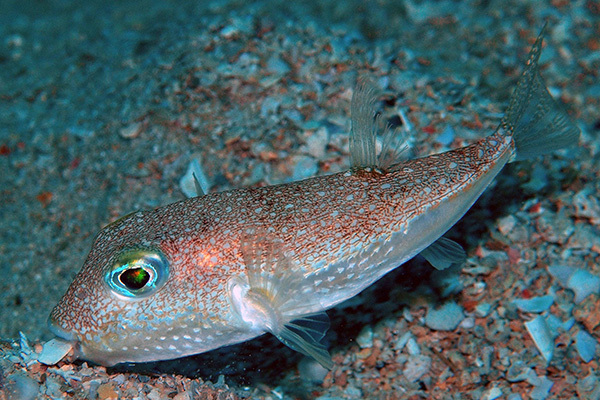 These small fish (generally around 6 inches or so long) spend a huge amount of time and energy building enormous (at least in comparison to their body size) sand nests with different gradations of sand and gravel in different concentric circles of the nest and all sculpted into beautiful channels and ridges. 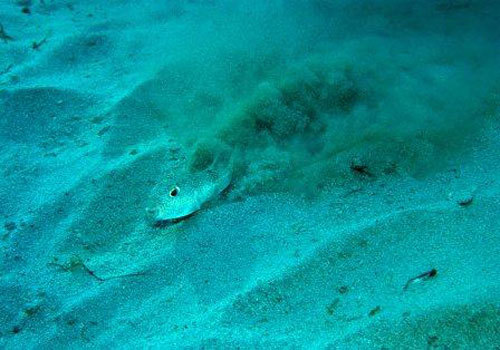 the fish creates these formations buy swimming very close to the bottom and fluttering his pectoral fins fast enough to generate a current of water away from its body. This water is what lifts the sand and small bits of gravel up and away to for the ridge and valley effect of the nest. A male pufferfish building his nest. Researchers are not completely sure what these spectacular nests are displaying, exactly. There is certainly the possibility that these nests are some form of sexual selection that is either displaying some aspect of the male’s quality, or is preferred by the female for some reason. It is also possible that the aesthetic aspects of the nest are a complete side effect of the male displaying the very fine sand in the middle of the nest which is where the female lays her eggs. 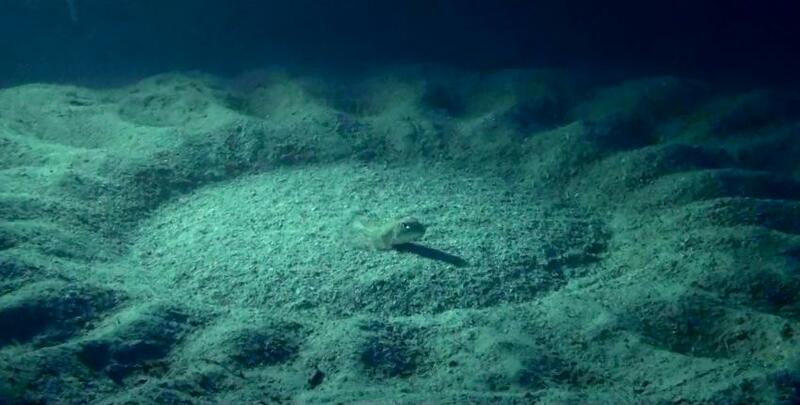 A male Torquigener Pufferfish resting in the middle of his nest. Regardless of what the female is looking for, once a male has been successful in attracting a female and convincing her to lay her eggs in his nest that nest is done. If he wants to attempt to breed again, he has to build a whole new circular nest with a fresh patch of carefully collected and sculpted fine sand. One nest only has enough for the eggs of one female. 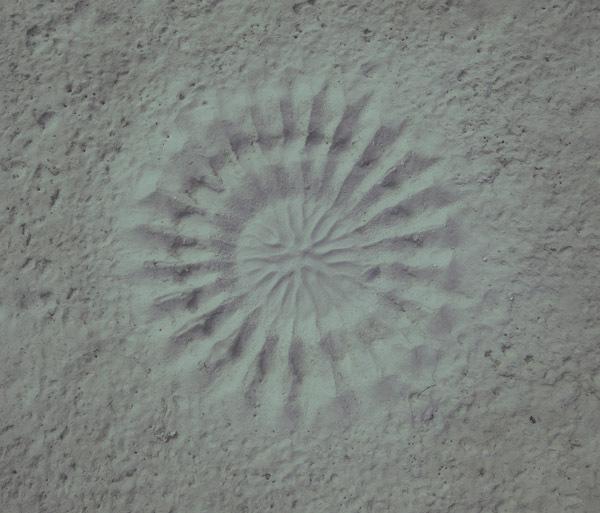 Looking directly down on a Torquigener Pufferfish nest.